These cookies are one of the most divine things I’ve ever eaten! A friend repinned these on Pinterest, and I immediately repinned and ran to the kitchen to make them! I love the combination of sweet and salty, and these were perfection! Enjoy! PS- Follow me on Pinterest @ Jamie Boyd! 1. Preheat oven to 170°C/350°F. Melt chocolate and butter together, either in a small saucepan over the stove, on in a bowl in the microwave. Set aside. 2. In another bowl, mix together the flour, baking powder and salt. Set aside. 3. In another bowl (or using a mixer), beat the eggs, sugar and vanilla together until light and fluffy. Add the melted chocolate/butter mixture and beat until combined. Add the flour mixture and mix until combined. Stir in the toffee bits- batter will be very thick. 4. Drop heaping tablespoons of batter onto a parchment-lined baking sheet, about 1 to 2 inches apart. (These cookies will not spread much.) Sprinkle a small pinch of sea salt over the top of each cookie, and bake for 12 to 15 minutes. 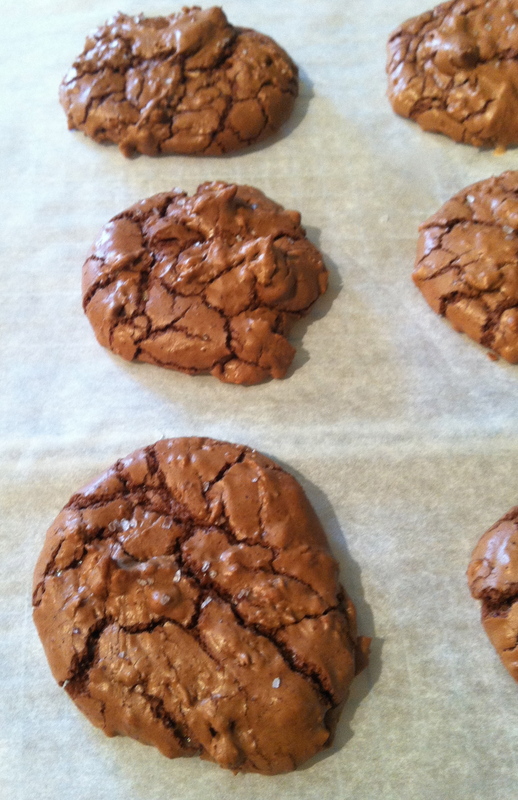 The tops of the cookies will be shiny, crackly and brown, like a brownie. Cool on a wire rack.